The concept of ideology is most generally associated with power relations and often has no regard to human feelings. The ideology can be interpreted as the way in which people think about the world and their ideal concept of how to live in the world. It is a shared belief of a group of people, groups deliberately planning to oppress people or alter their 'consciousness. In this process violence, torture and terror are used and people are judged by their ideological views. The Bolshevik Revolution had brought about a fundamental change in the organization of Russian society. The Bolshevik idea of "building a new man via social construction was an indigestible paragon for people like Uri Zhivago. Such people should adopt, perish or leave the system. When there is a dynamic social, change it, gives no place for personal feelings and everybody should get used to a collective life. Ideology and slogans become the center of life. People are judged politically. In such an environment, individuals are given less choices. Dr Yury Zhivago was one of the countless victims of such a system. Uri Zhivago a doctor and a sensitive man dramatically torn apart by forces beyond his control. Dr Zhivago became a victim of a personal tragedy as well as a collective tragedy. Yuri's mother died when he was a child, leaving him only a balalaika. Young Uri was adopted by his uncle. While living in Moscow he had a passionate interest in poetry. 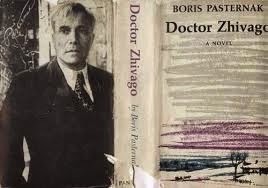 Doctor Uri Zhivago was recognized as a professional as well as a poet in the Russian society. But his life was torn between his two lovesTonia Gromyko his wife and Lara Antipova the beautiful nurse. When the Civil War erupted, Doctor Zhivago was forcibly removed from his wife and family by the Red Partisans and eventually his wife Tonia escapes to Paris with the children. When Strelnikove was arrested, Lara’s life was in danger and she was compelled to go with Victor Komarovsky -the immoral man and an opportunist. Thus, Dr Uri Zhivago lost Lara as well and becomes a fragile man. Lara disappeared off the street during Stalin's Great Purge. "Perhaps in a labor camp," narrated General Yevgraf, "A nameless number, on a nameless list which was later mislaid." Love and innocence lost he was aimless. Dr Zhivago dies of a heart attack while pursuing a woman he believes to be Lara down a Moscow street. Pasternak passionately renounced the Bolshevik idea of "building a new man" according to the Revolutionary measurements. Pasternak knew it was against nature. He argued that you could cut the tumors of injustice, which is a painful operation, provided that the patient should be kept alive. The novel Dr Zhivago is a saga, spanning Zhivago's life depicting several authentic characters.Boris Pasternak adored the poet Alexander Block Dr. Zhivago may have been based in part on the real life Russian poet Alexander Blok who was the most famous and influential in Russia. Alexander Block was a symbolist poet who sought to convey individual emotional experience through the subtle, suggestive use of highly metaphorical language. In the years after the revolution, Blok was very involved in social and political journalism and in criticism. Blok's disillusionment with the Soviet bureaucracy and censorship is suggested in his fierce and eloquent essay in 1921 "On the Poet's Calling" Blok died in Petrograd on Aug. 7, 1921 at the age of thirty-seven. Like the fictitious character, Dr Uri Zhivago Block died under physical and emotional exhaustion and with a great disillusionment. I used to admire your poems. I shouldn't admire it now. I should find it absurdly personal. Don't you agree? Feelings, insights, affections... it's suddenly trivial now. You don't agree; you're wrong. The personal life is dead in Russia. History has killed it. I can see why you might hate me. Yevgraf Zhivago is another Character Pasternak introduced in this novel. According to the bookYevgraf was Dr Uri Zhivago 's younger illegitimate half-brother who was working for the Cheka.Cheka was a secret police force that was founded soon after the Revolution. Cheka had power to arrest people. No judicial process was involved in assessing the guilt or innocence of any of its prisoners. Punishments, including the death penalty, were arbitrarily applied. The Cheka was granted the power of summary trials and execution of death sentence. Yevgraf Zhivago 's words correspond to the power that Cheka members had. Indeed as a policeman I would say, get hold of a man's brother and you're halfway home. Nor was it admiration for a better man than me. I did admire him, but I didn't think he was the better man. Besides, I've executed better men than me with a small pistol. "No revolution has yet tried the true way of liberty. None has had sufficient faith in it. Force and suppression, persecution, revenge, and terror have characterized all revolutions in the past and have thereby defeated their original aims. The time has come to try new methods, new ways. The social revolution is to achieve the emancipation of man through liberty, but if we have no faith in the latter, revolution becomes a denial and betrayal of itself."